There is no password input field in Mail→Preferences→Accounts anymore. The fields Incoming Mail Server and Usernamecontain the right information, but they are greyed out (cannot be changed). 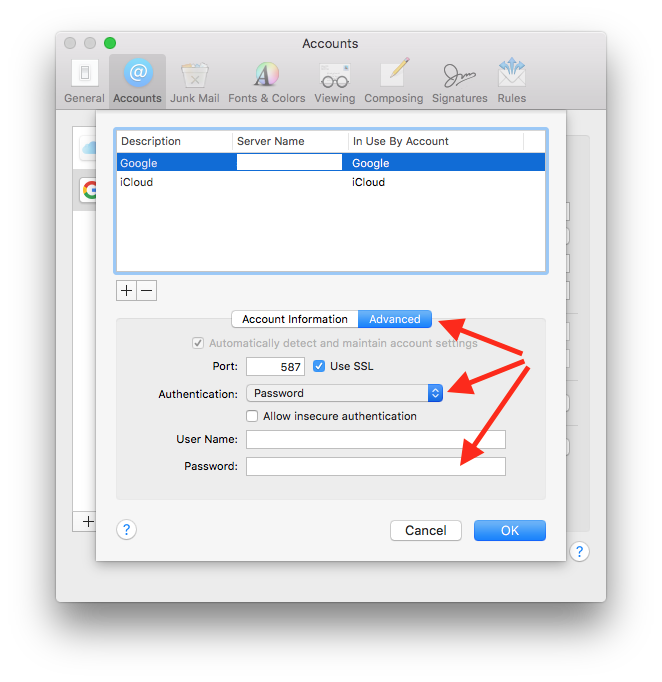 System Preferences→Internet Accounts: "Mail" is checked, but clicking on the "Details…" button only shows two editable fields: Description and Name. I tried to force Mail.app/Internet accounts Prefs to ask for the new password by deleting the imap.gmail.com entries in Keychain.app, but it did nothing. Deleting and setting up my gmail account anew in Mail.app is not an option. I'm running OS X 10.11.3. Google 2FA is enabled. Click Advanced tab and in the Authentication field select 'Password'. Enter your new password in the according field. When you try to send it, the mail application should create a large "Google style" dialog box, a bit like you might see on a Google sign-in dialog on a typical Google web service such as YouTube. Enter the password there; it will be cached somewhere internal, so it should keep working. No idea where it gets stored. This works with my Gmail account that is set up in IMAP. I assume this is the result of that accounts menu option "Automatically detect and maintain account settings". A late post. But, I thought of sharing a simple solution that worked for me. Instead of Mail --> Preferences, going to Mail --> Accounts and clicking on the failed gmail account will launch a popup with a password box and correct password input will login successfully. I would say go to Mail -> Preferences -> Gmail -> Advanced. There is a box labeled "Automatically detect and maintain account settings". Uncheck it. You should now be able to edit the respective fields (including password.) However, this seems to be greyed out for me as well, so I'm not sure. I'm not sure if this will work, but try it. 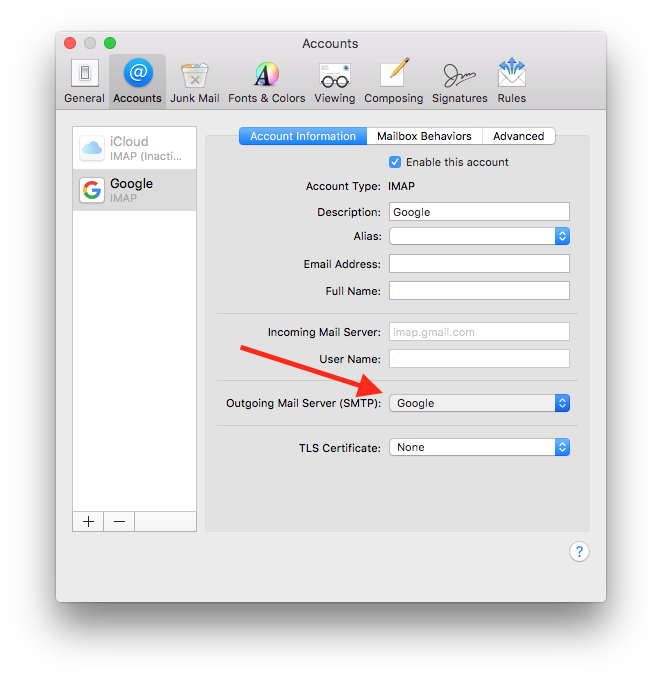 Go to Mail -> Preferences -> Gmail -> Account Information -> Outgoing Mail Server (SMTP) -> Edit SMTP Server List... Under authentication add some form (I'd try password first). To check if this worked, go to Window -> Connection Doctor and make sure everyone is green and happy. Not the answer you're looking for? Browse other questions tagged mail.app email password gmail . how to remove full my GMail “archive” for Apple Mail? Why am I having trouble entering a new Gmail password in Mail (and Internet Accounts)?